Updated February 2017: The numbers for source recall were updated to account for the small number of times respondents skipped the question. No number changed by more than one percentage point. Attitudinally, Americans are split on whether they feel loyal to their news sources – but behaviorally, they tend to stick to the same sources anyway. About half (51%) of Americans say that they are loyal to their news sources, while 48% say they are not particularly loyal. 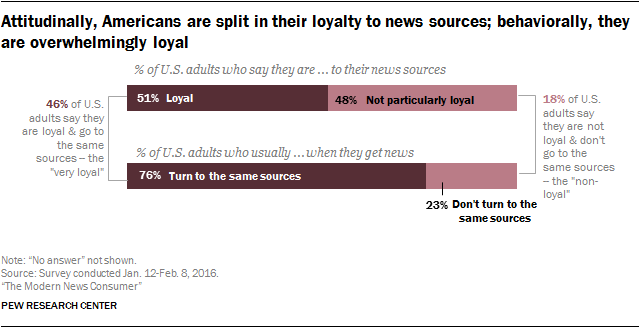 At the same time though, 76% of Americans say they usually turn to the same sources for news. Taken together, nearly half (46%) of Americans both describe themselves as loyal and also go to the same sources repeatedly (the “very loyal”). Just 18% are neither attitudinally nor behaviorally loyal (the “non-loyal”). Older adults are more likely to be in this group: 58% of those ages 65+ are “very loyal,” whereas only 28% of those ages 18-29 are. And women are more likely to be very loyal (49%) than men (43%). The “very loyal” news consumer tends to be a news cheerleader. The very loyal follow news at much higher rates than others: 67% follow it all or most of the time, compared with 45% of the somewhat loyal and 32% of the non-loyal. 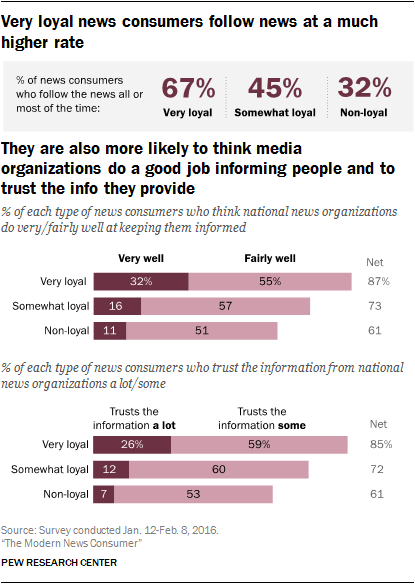 The very loyal are also more likely to trust national and local news organizations and think they do a good job informing people. And they are also heavily reliant on TV; 54% of very loyal news consumers prefer to get news from TV. No other platform comes close. Among the non-loyal, however, there is a much wider mix of preferred platforms including more weight towards digital sources when compared with the very loyal. There are also signs that people pay attention to the sources of news online, though less so among the “non-loyal” news consumers. A follow-up survey asked about the news consumers may have gotten online in the past two hours. Panelists who completed the January wave on the web and reported that they get news online were asked to participate. Survey invitations were sent at different times each day, and responses were accepted for two hours after the invitations were sent. Respondents were asked if they’d gotten news in the past two hours about various topics, where they’d gotten news from and what they’d done with the news, if anything. 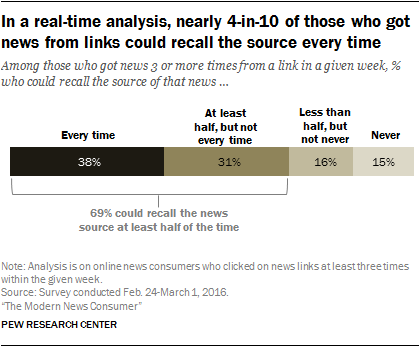 When asked if they remembered the source of an article they arrived at from a link, about 4-in-10 (38%) remembered every time; only 15% never remembered. This is particularly true among the very loyal and the somewhat loyal. Of those who got news from links, 39% of the very loyal and 41% of the somewhat loyal remembered every time, compared with 28% of the non-loyal.